Will the UK voting system survive 2015? The SNP romp home, winning well over 20 seats. The Green Party also do the best they’ve ever done, gaining 5% of the national vote. Yet the latter party only win a single seat despite getting a higher UK share of the vote than the former. UKIP do the best they’ve ever achieved in a general election, with 16% of the vote. They only win around half a dozen seats however. The Lib Dems meanwhile creep home with just 15% of the vote, yet hold onto over 20 seats. Labour gets slightly fewer votes than the Conservatives. Despite this poor performance, they win more seats than their opponent. Their total vote share hovers at around 60% of the vote, the lowest combined score since 1918. No single party gains a majority. More than that, no two party majority is possible, with the exception of a Labour-Conservative coalition. I’m not suggesting that all of these outcomes are going to happen, merely that at this point in time they are all feasible. If they do all happen at once, it will be the perfect storm of electoral outcomes which will put our single member plurality voting system (“SMP”)* under greater strain than it has ever known. This has in fact been a long time in coming. The reality is that “two party politics” is a historical quirk that has only enjoyed a very brief period of popularity. The modern political party as we now regard it didn’t even exist when the Third Reform Act was passed in 1884 enfranchising most men over the age of 21. 16 years later the Labour Party was born and we had decades of 3+ party politics until the Liberals pretty much gave up the ghost in the 1930s and 40s. 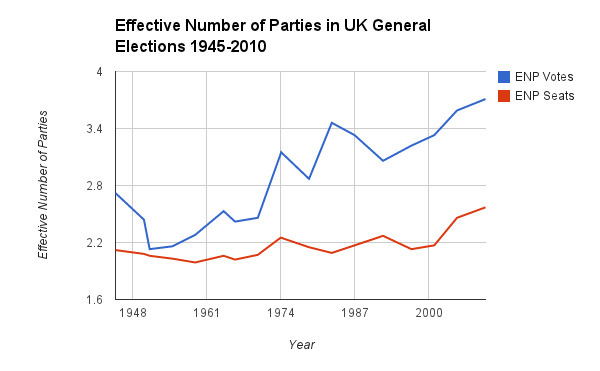 In 1951, two party politics reached its apex with the combined Labour-Conservative vote reaching 96.8% but by 1974 that was down to 75.1% and in long term decline. We can see this trend by looking at how the gap between Effective Number of Parties (“ENP”) by votes and seats has widened over the last 70 years (ENP is an academic concept used to estimate the number of parties active in an election according to their relative strengths). As you can see, the disparity between votes and seats has widened almost inexorably. Indeed, it is also worth bearing in mind that the voting system itself was stitched up to reinforce this hegemony. SMP is not, in fact, the only voting system to have been used in a House of Commons election. Multi member constituencies were quite common for urban areas at first, and university seats were elected using Single Transferable Vote from 1917 until 1950. You can see how, in the first decade after single member constituencies were universally adopted in 1950, the disparity between votes and seats actually got worse. By contrast, if we had not gone down that route, it seems likely that UK elections would have done a better job at reflecting votes cast. Josep Colomer asserts that as political systems embrace multi-party politics, they tend to drift inexorably towards proportional representation. A crucial point, however, is that coordination failures can be relatively more frequent under majoritarian electoral systems, especially for the costs of information transmission, bargaining, and implementation of agreements among previously separate organizations, as well as the induction of strategic votes in favor of the larger candidacies. With coordination failures, people will waste significant amounts of votes, voters’ dissatisfaction with the real working of the electoral system may increase, and large numbers of losing politicians are also likely to use voters’ dissatisfaction and their own exclusion, defeat or under-representation to develop political pressures in favor of changing to more proportional electoral rules. Sadly Colomer doesn’t actually tell us how this switch will happen, but we are already seeing the current system falling apart. Of all the potential outcomes I listed at the top of this article, the biggest problem from a governance point of view is that difficulty we might encounter in forming a government. In 2010 (and despite the more fruity speculation by some), the arithmetical logic behind the Conservative-Lib Dem coalition was quite straightforward: there was simply no other way to form a two party coalition, apart from a Conservative-Labour one of course. Despite some sunny optimism about the viability of a Labour-LD-SNP-Unionist government, the fact is that such a rainbow would have been incredibly hard to maintain. A lot of political commentators have asserted that the outcome of the 2015 general election is impossible to predict. They are only half right. It’s actually quite clear which way people are going to vote; what is unpredictable is a voting system that is so poorly suited to its purpose that the numbers that it chews out could go anywhere. That this doesn’t lead more people than it does to declare that it is time to pick another system is a sad testament of how badly let down our media and politicians are letting us down. After the 2011 AV referendum, the No campaign declared the matter of the voting system settled for a generation. The 2014 Scottish independence referendum has already demonstrated to us how such things are rarely that simple, and it seems likely to me that the debate over whether SMP is any longer fit for purpose will kick off in a big way after this year’s election. At least, it will among the public. The question is whether civil society and the media will join that throng or allow it to peter out. It can’t be left to the Electoral Reform Society and Unlock Democracy to make the case. And how will the political class respond? Will they embrace the tide of history in the way that they did eventually over the Reform Acts and female suffrage, or will they continue to resist it? I hope they’ll take the pragmatic, former option; if they don’t we could be looking at decades of instability. For me, it’s the only truly interesting question about this year’s general election; until we have a system which in some way reflects the settled will of the people, everything else will just be a case of rearranging the deckchairs on the Titanic. * Personally I prefer to refer to the UK voting system as “single member plurality” and not “first past the post”. This is for several reasons. Firstly, it is a simple fact that it better describes the actual system: we have single member constituencies and you win by getting the plurality (largest share of the vote). “First past the post” on the other hand doesn’t actually describe how the system works at all – ironically, to the extent that it describes anything, it better describes the Alternative Vote system/instant run-off voting which actually has a “winning post” (50%). Secondly, it is the internationally recognised description of the system; the UK loves its quirky and confusing names for voting systems (Additional Member System instead of Multi Member Proportional for example), and it is a fairly contemptible bit of British chauvinism. Thirdly, I think that allowing the supporters of SMP to use their preferred, familiar term puts them at an advantage as all other voting systems sound alien and technical in comparison. That’s nonsense, and I don’t think we should allow them the privilege. I guess we’ll be doing a lot of mythbusting over the next year or so, so I might as well start now. Iain Dale has just issued a couple of posts about the Alternative Vote and Single Transferable Vote which contains assertions that simply can’t be sustained. Let’s go through them. First of all, neither AV nor FPTP are proportional systems and the reason for introducing AV is not to make elections more proportional. Let’s by all means have that debate, but the referendum won’t be about that. So arguing which non-proportional system is more or less proportional is the world’s most pointless exercise. We can of course talk about whether a particular election result would have been more or less proportional, but it is a pointless exercise as it involves making huge assumptions and in particular it assumes that the election is a one-off, not part of a series. So, for example, those famous bar charts that people moan about in elections are only used as an election tactic because under FPTP people have to rely on the past pattern of voting to decide how they might vote tactically – or whether to bother voting at all. Because tactical voting has become so common and that in some constituencies it has become ingrained (I am reminded of the various Cornish Labour supporters I’ve met over the years who take it for granted that they vote Lib Dem in general elections), we can’t really know how changing the voting system will change voting behaviour. The example that is most frequently cited is 1997, in which it is generally believed that the anti-Tory swing would have had the effect of increasing the Labour majority at the expense of the Conservatives. That is probably true, but it wouldn’t have been if the 1992 election had been held using AV, in which case the pattern would have changed. And it is also the case that big swing elections like that happen less than once every general election. 2010 doesn’t compare and while the Labour and Tory seats may have changed slightly under AV this May, the main beneficiaries would have been the Lib Dems – thus it would have been slightly more proportional. Australian AV elections are generally more proportional than UK FPTP ones but ultimately that’s irrelevant because AV is not a proportional voting system. The reason for introducing it is to give voters more choice and more competition within each constituency. Yes indeed, Iain Dale did indeed write that. Just for the record (I guess most politicos know this but a lot of others don’t): under FPTP you don’t need 50% of the vote or indeed any minimum number of votes. In Scottish four way marginals – and even in ones currently regarded as ‘safe’ – the winning threshold can be very low indeed. The example Dale cites of the 1979 Scottish Parliament referendum where the threshold was set ridiculously high was one of the most undemocratic acts of thwarting the will of the people we’ve ever seen in the UK (thanks, Labour!). I’ve argued before that the single member constituency link is one of the most pernicious aspects of UK democracy, and stand by it. I’ve never heard a coherent defence of it – it just gets invoked by people as if it means something inherently profound (ironically, often by individuals like Iain Dale who are more than partial to a bit of carpetbagging themselves). But does STV, my preferred system, actually weaken the constituency link? The short answer is, it depends. Ask any Irishman and they’ll tell you that it certainly doesn’t. Indeed, the effect of STV is to make politics in the Republic ultra-parochial. Iain Dale ought to talk to David Trimble if he doesn’t believe me. That said, there is no question that making constituencies larger and having multiple MPs represent them will have some effect of dilution. The constituency link between MEPs and their regions is very weak indeed, although that link would be strengthened by replacing the current list system with STV. But no-one is seriously suggesting STV constituencies for the House of Commons with more than six members maximum. In Scottish local government, all constituencies have three members, although that is generally regarded as too inflexible. Personally, I don’t think it would be sensible for constituencies to, on average, be larger than four members (I would settle for three members on average, while recognising that it would not be especially proportional). Furthermore, the flexibility of STV is such that ultralocalist candidates will still emerge if there is a genuine (as opposed for forced) demand for them. A candidate could campaign on a platform of wanting to represent a specific town within the constituency and still win, for example. It would be up to the voter to decide how localist they wanted their MPs, not the boundary commission. There is also the question of political representation. Whether he thinks he does or not, my MP does not represent me. He is very unlikely to ever reflect my views in Parliament and he certainly can’t represent my views and my Tory neighbour’s at the same time. So where is my constituency link? By contrast, in a multi-member constituency I would have a much better chance of having my views represented. And finally there is the matter of competition. Where STV is used, the effect is that elected representatives are under much greater pressure to champion local issues than they are under FPTP. The effect is that a local campaign will often find it has three champions in Parliament where under a different system it would only have one. Ultimately, we have to ask ourselves if the people of Manchester (for example) are better served by 4-5 MPs representing the city as a whole and coming from across the political spectrum, or carving the city up into 4-5 artificial constituencies. I think the former, but that isn’t a debate we will be having for the foreseeable future. And it is deeply ironic that one of the things the Tories are insisting upon at the moment is to redraw the constituency map so that MPs represent larger areas and that their constituencies are based on even more artificial boundaries. If they care so much about the constituency link, they should do the exact opposite. The Jenkins proposal included just a 17% top up of MPs elected proportionately. While that would mitigate the most extreme effects of using unproportional systems, its impact would be strictly limited. You could describe it as semi-proportional, but not proportional. This is the exact opposite of the truth. When it comes to candidate selection, there are two basic types of electoral system: there are ones in which the party chooses the candidates (however democratically) and there are ones in which the party chooses a shortlist of candidates from which the electorate chooses. Single Transferable Vote and open list systems do the latter. Closed list systems, of which first past the post is one, is in the former category. It really is one of the most monstrous lies of the Tories to condemn proportional systems for using closed lists when that is a different issue to whether the system is proportional or not, and that they endorse closed lists themselves. STV gives the party dramatically less control over candidates. Indeed, the candidates of each party effectively compete with one another, and that can cause tensions. That’s why people like John Prescott fought tooth and nail against it being introduced for the European Elections in 1998. That’s one of the reasons why politicians are wary of it in Ireland – and why the voters in Ireland like it so much. There is an issue that parties have the option of only fielding one candidate if they want to, but that is no worse than under first past the post, and it is more likely in small constituencies – which is what Iain Dale endorses. We’re going to see a lot more of this forked tongue bufoonery over the coming months – especially since the debate on which electoral system we should use for the House of Lords will be sparking off soon. It is going to really try my patience. One of the most remarkable things about the Labour Party is why it persists with an internal electoral system that has served it so badly. We can all remember the scandalous 2000 selection for a Mayoral candidate when Ken Livingstone won overwhelmingly amongst the membership but was blocked by a combination of the MPs and union block vote. The deputy leadership contest was nearly a repeat of this, albeit less so. The figures, which someone has now helpfully posted on Wikipedia, tell the full story. In the final round Harman won more than 56% of the membership vote and around 52% of the combined membership and affiliated organisations’ vote. Yet, even assuming all 371 cast their votes, if just 5 MPs or MEPs had given her a lower preference over Johnson, she would have lost. Indeed, Johnson was consistently and comfortably beaten by Benn in the membership college right up to the point until the latter was excluded. We’ll never know, but it is entirely possible that Benn was robbed. Cruddas’ vote is also interesting. He didn’t do terribly well in the membership college, yet did brilliantly amongst the affiliated organisations (I couldn’t help but laugh when I read the comment from a Cruddasista on LabourHome that their candidate had lost due to the “Soviet” electoral system – if the system was less Soviet, Cruddas would have got less far than he did!). Unlike the Livingstone debacle in 2000, all the unions and other affiliates now ballot their members, yet it is clear that the steer from the union leadership still has a significant influence in a way that CLP support does not. It would be interesting to see what the turnout for this college was: I suspect that it was quite low, indicating that a large number of union members are technically affiliating to Labour (and giving the party cash) while not identifying with the party in any way. What we’re left with is a system that I simply fail to see is justifiable in 2007. The fact that the MPs and MEPs get a whole third of the vote to themselves is appalling, especially when you consider that they already get to pick the shortlist and get to vote in both the other colleges as well. The affiliates’ college is easier to justify, but even then it leads to a situation whereby the number of times an individual gets to vote is only limited by the size of his bank balance. Instead of this current system of one-member-one-third-of-a-vote (or alternatively one-member-however-many-votes-one-can-afford), why not simply aggregate the memberships of all the affiliate organisations and members together? If the trade union-Labour link is so vital, this should be a no-brainer. But then, the voice of the individual trade union member has always been a low priority for both the Labour Party and the trade union leadership themseles. Why else are they currently embarking on this mad rush for mergers and acquisitions? Will VoIP kill Eurovision phone-ins? A simple thought: with VoIP services becoming ever more popular, will the price savings make it viable for mass cross-territorial voting in the Eurovision Song Contest? Imagine if a campaign were to be run in a country the size of, say, the UK, to stitch up the Balkan states’ votes? In the short term, those desirable 8, 10 and 12 points might be out of reach, but it could certainly guarantee a better position than joint 22nd. Malta has come out against the Eurovision phone-ins, possibly the first among many. If we want Eurovision to remain democratic, instead of a phone-in, why not have a deliberative citizen’s jury? Each country could still have a phone-in a few weeks before, but the entrants would be chosen by lot to sit on the judging panel. They would have to supply proof of residency in order to take their place. A final question: how can you blame Scooch for doing so badly? The Great British Public voted for them – the Great British Public have no-one to blame but themselves. Okay, okay, I’ll try to shut up about Eurovision now. Yeesh! Okay, I admit: the Scottish results have got me stumped. It was the list results that did it. My expectation was, and the polls appeared to back me up, that the Greens were on course to get about the same share of the vote that they had before. Instead, they were wiped out. The Tories were down on list seats as well. So, of course, were the Lib Dems. What stopped the Lib Dems from making no losses was a whopping 4% dip in the West of Scotland, which apparently cost us an MSP. Why was this? It was already being mooted that the new ballot paper design would harm the smaller parties as people might think they had to vote for “Alex Salmond” AND “SNP” rather than split their ticket. This may well have been a large factor, and the Greens (and other) may need to reconsider their strategy of only fielding list candidates. But in an election with 100,000 spoilt papers, one can’t help but suspect that they were robbed. The final scores on the doors at least means that the Lib Dems have been spared one particularly nasty decision: the combined SNP/Lib Dem vote is 3 short of a majority. Even if the Greens threw their lot in, that would mean a majority of 1, which isn’t exactly a delicious prospect. Adding Margo Macdonald to the mix might help, but her price would no doubt be pretty high. I could be proven wrong, but I can’t see Nicol Stephen wanting to join such a precarious executive. That doesn’t however mean the SNP wouldn’t be able to negotiate a multi-option referendum, which if they want an independence vote is pretty much their only option now. I can’t see them getting a majority in favour of Local Income Tax either, unless they come up with some kind of compromise. Imaginative municipal finance reformers might want to consider a package that includes the localisation of a proportion of the existing income tax combined with a land value tax to keep the Greens happy. But maybe that is me disappearing into a Georgist Wonderland. I suspect the promise to scrap the Graduate Endowment has rather more chance of getting through, which is a shame because I happen to think the Scots don’t know when they are onto a good thing here. In short, compared to what was widely predicted, it is Labour that seem to come out as the unlikely winners of the Scottish election. Going from 50 seats to 46 is nothing in the grand scheme of things. They can now spend 4 years in opposition making life as difficult for Salmond as possible. Either way, every single decision made by the Scottish Executive will be subject to a degree of scrutiny that we are simply not used to in the UK. That can only be a good thing. I was on Five Live’s Julian Worricker programme briefly on Sunday, making my nomination for most credible politician as part of their Political Awards (the piece was on at around 12pm, so about 2 hours in if you want a listen). My nomination was for David Howarth. I have to admit, I struggled with this category (cynicism can be quite disabling at times), but I nominated David because of his work in exposing the Legislative and Regulatory Reform Bill. Specifically, I interpreted ‘credible’ to mean a good Parliamentarian. It was a shame therefore that much of the discussion on the programme was concerned with linking ‘credibility’ with the idea of being a good constituency MP, i.e. doing casework, listening and representing constituent’s concerns. The rise of the community-focussed MP has gone hand in hand with the diminution of local politics. As local government has been centralised and sidelined, so MPs have adopted the role of super-caseworker at the expense, it seems to me, of actively taking an interest in the work of Parliament itself. This has been helped by the anti-politics prejudices of the media, which has a confused notion of wanting to see MPs being both the proxies of the communities they represent while at the same time berating them for being mindless automatons. The problem is, no individual can ever represent the diverse range of views to be found in even the smallest of rural constituency. Yes, I doubt that even the Western Isles has a Fascist Hive Mind – and the fact that it’s a hotly contested two-way marginal would tend to support that view. So, representing the community’s view is simply an impossibility. What we have instead is, at best, an MP that works to represent the views of a vocal minority. And yes, I do accept that the Lib Dems share a large amount of responsibility for this sort of corruption of parliamentary politics. I don’t blame ‘community politics’ a concept which, at least in the Greaves and Lishman sense, I strongly support. I do however blame the way this idea has become the abiding strategy of the party and has influenced a new generation of politicians, particularly people like Grant Shapps. The key problem is, what is a perfectly laudable aim of involving people more in decisions that affect them has, via our political system, become a zero-sum race to the lowest common denominator. There are two policy outcomes we ought to consider about this. The first is, but of course!, proportional representation (specifically STV in multi-member constituencies). No-one would advocate creating a system which abolished constituencies altogether. Indeed, my own preference would be for just 2 or 3 member constituencies in the Commons. Even just having 2 member constituencies would have a massive impact in terms of bringing an interest in political principle back into the Commons. The second, more controversially, would be a massive curtailment of how much MP’s can spend on carrying out their constituency work. This has grown massively in recent years, yet all it does is replicate (undermine even) local government and the customer relations side of public services. Worst, it has created incumbency protection into our system, giving MPs a platform which they can use to help their re-election campaigns. I’m a supporter of state funding of political parties (or at least incentive based mechanisms such as matched funding), and I’ve noticed that many of the critics of such proposals are in fact broadly supportive of existing funding mechanisms; nopublicfunding describes the existing financial relationship as “sensible and necessary“. The more I’ve debated with such people, the more I’ve come to the conclusion that the status quo does indeed need rethinking. Apart from anything else, it would stop the hypocrisy of politicians setting up Chinese walls between their constituency and partisan work. My first response when reading about Forward Wales’ plan to field both party and ‘independent’ candidates in the next Assembly elections was, “what took them so long?” The Electoral Commission appear to have now woken up to this, but really it is too late. This is the real danger of the AMS system, not the “dual candidacy” bugbear which Labour have banned. Indeed, were it not for the fact that they would pay too high a political price for doing it, on paper it is Labour that would have the most to gain from playing this kind of game. That said, it has the most to gain from the status quo as well: if may struggle to get list candidates elected, but FPTP gives it such a disproportionate advantage in Wales, that hardly matters to them. The only real solution is to have candidates elected under a single system. Hopefully this will be one more nail in the coffin of this system, but it won’t be surrendered without a fight, especially given that the Welsh Raj Peter Hain has already pledged to veto any attempt by the National Assembly to get its own house in order.